After falling into a Tumblr community of disabled folks over years of blogging, I found myself interested in the digital rhetorical practices of disabled communities. Sites like Tumblr and Twitter, where I chattered, complained, rejoiced, and cried with folks like me going through the ringer of being disabled and trying to make life work, showed me how different digital communities create their own rhetorical practices and use technology in cripped (click here to read Sami Schalk’s definition and nuancing of this term) ways to communicate with each other and with the normate world. I find this process fascinating and want to bring conversations about cripped uses of technology and digital rhetoric in my time here with the Digital Rhetoric Collaborative. To me, a cripped digital rhetoric means understanding how the material, emotional, technological, and spatial dimensions (along with many others) of digital spaces let in or leave out different kinds of people. Cripped digital rhetorical inquiry questions who can access a text and asks us to consider the choices we make when we design digital texts, environments, and objects. It embraces questions of how disabled people use technology to navigate the world, and encourages us to think about how technologies that are commonplace have roots as assistive tech for disabled people (such as the growing use of voice to text in smartphone and tablet writing) as well as the values embedded in new assistive tech. Photo by Norman Lenburg, accessed from the University of Wisconsin Collection. 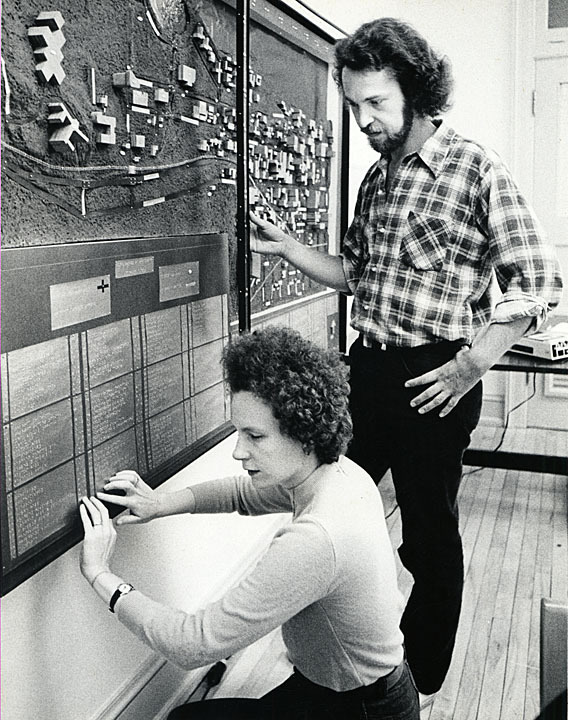 In the McBurney Resource Center, a woman reads a 3D Braille map of the University of Wisconsin Campus. A cripped digital rhetoric also asks us to tarry with and consider how and why different disabled communities create rhetorical practices as well as examine how and if these practices should be translated into different spaces. For example, a current “debate” in higher education circles takes up trigger warnings and students’ call for their use in the classroom environment. I put “debate” in scare quotes because, overwhelmingly, most participants do not take trigger warnings seriously and consider them a threat to academic freedom. The AAUP has even issued a position statement on trigger warnings, fearing their movement from the “blogosphere” to the university environment. However, an investment in cripped digital rhetoric would seek to understand the emergence of trigger warnings in digital communities of disabled people and question whether or not they could be part of a broader program of making writing classrooms in particular accessible to disabled students. In my time here as a DRC fellow, I hope to facilitate lots of talk and writing about cripping digital rhetoric both in and outside of the DRC webspace. If you have questions or suggestions for what this might look like, send me an email at nsimpkins@wisc.edu or tweet at me at @neilfsimpkins!